Chris from Abington PA had a good morning in the surf landing this nice striper. Looks like the bite is starting to heat up on the beach so get your waders and surf rods ready. There have been reports of some weakfish around. 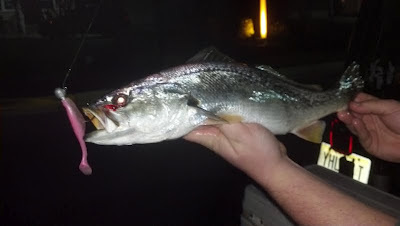 In the picture attached you can see a really nice 18 ½ in fish taken last night. If you want to try your luck at a weakfish soft plastics are the lure of choice Bass Assassins and Fin-s Fish. A variety of colors have been working but pinks and whites are the most popular. Try around the light of a dock or bridge or the back bay along the edge of a channel. Top of the tide and the beginning of the out going is producing the most fish. Avet’s have arrived at Sea Isle Bait and Tackle. We have a mixed bag of colors and sizes. Special orders are coming in daily and we will be placing another order at the end of the week. If you need to place an order pleas let us know as soon as possibly so we can get yours in.